• One-piece design allows installers to mount and bundle wire or cables single-handedly. • Fastener delivers high extraction force for reliable performance, yet it’s easy to install. • Can be unscrewed or extracted from threaded holes for easy removal and re-usability. • One-piece design allows installers to mount and bundle wire or cables single-handedly. • Fastener delivers high extraction force for reliable performance, yet it’s easy to install. • Can be unscrewed or extracted from threaded holes for easy removal and re-usability. 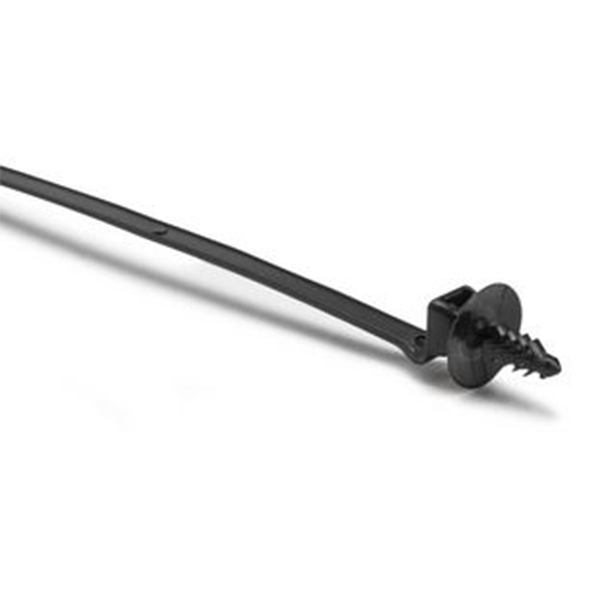 HellermannTyton Blind Hole Mount Cable Tie for threaded holes offers an easy-to-use method for bundling and affixing cables. The one-piece mount offers a low insertion force and aggressively resists pull off, for secure attachment to panel holes with thicknesses from 0.02" to 0.28" or threaded blind holes. The disc on top of the mount covers the hole and minimizes ingress of water and debris.